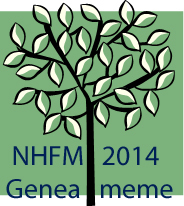 Back in the middle of August I asked if other geneabloggers would like to join me in a genememe to celebrate National Family History Month 2014. I called it the National Family History Month Geneameme and these bloggers decided to respond. Whenever there’s a meme doing the rounds it’s so interesting to see the commonalities between us all as well as be inspired by the way others pursue this addictive love of ours called family history. Why not click on these links, see what they had to say, and either “like” or leave a comment. I do hope I haven’t missed anyone but please let me know if I have. Caitlin from Genealogically Speaking blog was very 2014 and presented hers as a YouTube video – do click on it to see what she had to say. Thanks everyone for getting involved and sharing the fun with me. Thanks also to Shauna for her inspirational work and the vast offerings that were available during the month, not to mention all the sponsor treats. I’m sure everyone has gained lots of knowledge and inspiration to carry them through another year of exciting family history. This entry was posted in Memes and Themes -Blogging and tagged National Family History Month 2014, National Family History Month Geneameme by cassmob. Bookmark the permalink. Pauleen, Thanks for creating this #NFHM2014 opportunity for us to see into our online friends’ geneaworlds. I noticed some consistent attributes coming through as I read the posts: commitment, passion, genearosity, love of learning, a willingness to try something new and very full plates. What a great bunch of online pals we have. Indeed we do have a great bunch of genimates! You’re right about the attributes too. Pauleen, thanks for posting the full list. I’d missed some. Thanks for organising this Geneameme – it is so interesting to learn from others – and I had no idea how many genealogy groups there were on Facebook ! I think we all had fun Kerrie Anne…I learnt about new FB groups too.